Increasing interest in CD-i Emulation arrived today. cdifan (author of CD-i Emulator) has been contacted by two people about assisting the MESS project (a fork of MAME) with their CD-i emulation driver. cdifan: "Before any of you get their hopes up, I've taken a quick look at the MESS CD-i emulation sources and it seems to be about at the stage where CD-i Emulator was around summer 2003, two years before the public release. Unfortunately, this is exactly where the hard part begins. Based on a comparison of video emulation sources, I'd say the MESS code is at a few percent completion at most, and this is for video emulation alone, arguably the easiest part of CD-i emulation. So far MESS only emulates the 68070 processor and a small part of the MCD 212 video chips, and these are both documented. From this point on they will hit nothing but undocumented chips (except for a few small support chips such as NVRAM). However, I am willing to share information; we are currently trying to work out a way to do it." Multi Emulator Super System (MESS) is an emulator for many game consoles and computer systems, based on the MAME core. The primary purpose of MESS is to preserve decades of computer and console history. As technology continues to progress, MESS prevents these vintage systems from being lost and forgotten. MESS emulates portable and console gaming systems, computer platforms and calculators. The project strives for accuracy and portability and therefore is not always the fastest emulator for any one particular system. MESS supports 376 unique systems with 1069 total system variations and is growing all the time. However, not all of the systems in MESS are functional, some are marked as non-working or are in development. MESS was first released in 1998 and has been under constant development since. Now this is an interesting find... Devin dug up a picture of a previously unknown CD-i player made by Sanyo. 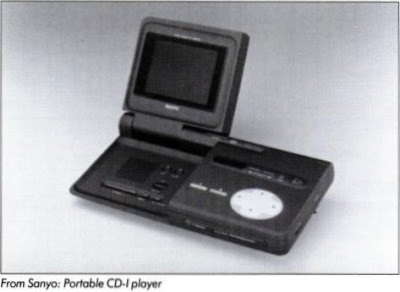 Constructed around the same time as the Sony Discman (which I almost mistaken it for!) by all accounts. Nice looking piece of kit, now how do we find an ex-Sanyo employee who took a couple of retirement units for his own use? It makes you wonder what's at the bottom of some landfill sites doesn't it! it's not unusual for a prototype design to fall foul and never see the light of day. As the late Silas Warner described to us in his statement, before launch half the worlds supply of CD-i players were made redundant by a small technical fault! Did the same fault strike down a series of Sanyo CD-i players? We can only speculate at this point, however it is a tantalising prospect and a damned nice looking CD-i player! 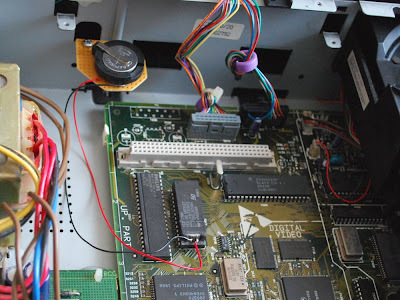 Richard lagendijk made a new article about repairing the timekeeper battery on a CD-i player. Based on previous articles published here on Interactive Dreams, see this as fine-tuning the tutorials for people who would like to repair the battery by themselves. Inside a CDi player is a special IC where games can store data. This data is stored even when the CDi player is switched off. The data is normally the high-score list of the game. After a number of years the high-scores are not stored anymore. The Timekeeper IC does not function anymore. A simple solution is to replace the IC in the CDi player. But what is wrong with the Timekeeper IC? The IC is a RAM memory with it's own battery. This battery keeps the data inside the RAM available. Sadly after a number of years the battery will be empty. 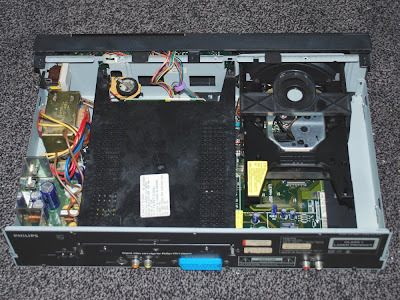 On the picture you can see the inside of the CDi player. This is a Philips CDi-210 player. The red arrow points to the Timekeeper IC (M48T08 150). Click on the picture for a bigger version. Opening the Timekeeper IC is not as easy to do as it's sounds. The battery is sealed inside the upper-part of the IC. With a small saw I removed the front (upper) part of the IC. After that I took a sharp knife and slowly removed the sealing compound out of the IC. Be careful with this, because you do not want to damage the connections from the battery to the RAM memory. 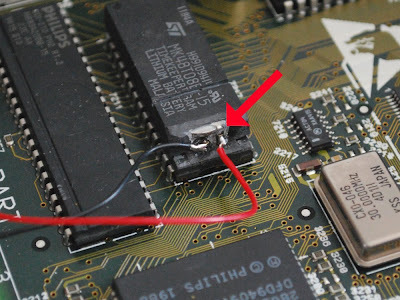 Also do not damage the lower-part of the IC where the RAM memory is. On the picture you can see a small part of the battery. Remove the sealing compound until the two connections from the battery to the RAM memory are available. Check with a Voltage-meter where the positive and the negative connections are on the battery. Solder a wire to each of the connections from the battery to the RAM memory. I used a red wire for the positive and a black wire for the negative, but you can use other colors. Keep the wires long enough so that you can place the "new" battery on a easily accessible place. After you have soldered the wires, you need to disconnect 1 side of the old battery. The red arrow is pointing to the point where I cut through the connection with a sharp knife. Now it's time to clean the inside of the CDi player. 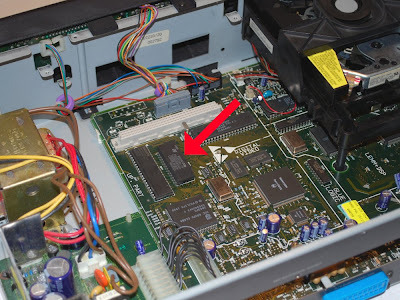 Make sure that all the dirt from opening the IC is removed from the CDi player. For extra strength you can add some (hot-) glue to soldered wires. For the new battery I used a old battery holder from a PC. The battery is a CR-2032 (3 Volt) type. The battery holder is placed upon a piece of experimental pcb. This pcb is mounted on a small metal tab that was not used. The wires from the Timekeeper IC are connected to the battery holder. The battery can be replaced easily, but that not necessary for another 10 years. After everything is installed you can close the CDi player. On the picture you can see that the Digital Video Cartridge is installed. Testing if it works. 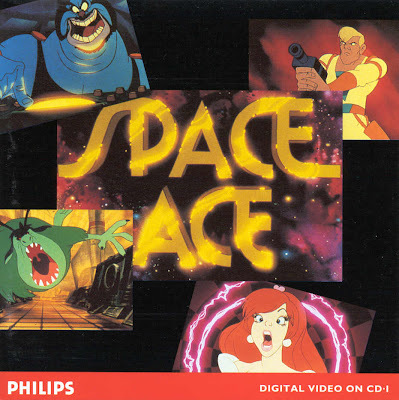 Start the CDi player and play a game. Save your high-score. Switch the CDi player off for a while and switch it on again. If the high-score is still available you have successfully repaired your Timekeeper IC. Ace, Earth's greatest hero, is being attacked by the evil commander Borf. Borf has just kidnapped the beautiful Kimberley, and is plotting to take over the planet Earth with the help of his dreaded weapon - the Infanto Ray. Only you can guide Ace through treacherous battles to destroy the Infanto Ray, save Earth and rescue Kimberley. Be valiant, space warrior, the fate of Earth is in your hands! Thanks to Sebastiaan (HalfBlindGamer) for these.